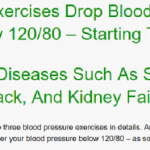 Natural High Blood Pressure Exercises Program By Christian Goodman Review: Worthless Program! You are here: Home / Blog / Natural High Blood Pressure Exercises Program By Christian Goodman Review: Worthless Program! Is Natural High Blood Pressure Exercises Program by ‘Christian Goodman’ worth your money or not? In my opinion, I think it is a scam designed to give you false hope, and you should stay away from it. Why do I say this? Read this review to find out. Now take note of this claim above because it is the main reason why I call this program a scam. For now, let’s briefly look at how this program works. Exercise 2: This one is designed to ‘release all the emotions that are suppressed throughout the day due to our social requirements, without any drama.’ In other words, this exercise will supposedly relieve your stress, which of course, is one of the reasons why a lot of people have high blood pressure. Exercise 3: This exercise is supposedly designed to ‘soothe your body and mind shortly before a good night sleep.’ Goodman claims that this exercise is capable of curing your insomnia or other sleep disorders typically treated with drugs. These exercises, Goodman continues, has helped ‘88.7% of people who use it’ to lower their blood pressure ‘within a week.’ He also goes as far as to claim that his exercises will work for everyone irrespective of the cause of your increased blood pressure. Now this claim is a very big problem we’ll discuss later in this review. So lets begin. Why is Natural High Blood Pressure Exercise Program a scam? Christian Goodman calls himself a ‘well known natural health researcher’ whose articles have been published in ‘several thousand websites and offline journals.’ Well I did a Google search for articles written by Goodman on several website and what did I find? You guessed it: NOTHING. To make matters worse, there is no way of verifying the existence of Goodman. He has no photo on his website, no social media presence. Bottom line: It is impossible to find out who this author really is. With that, we can’t verify that this author exists or is even qualified to give medical or physiotherapeutic advice for patients with high blood pressure. This means that should anything wrong happen as a result of using this program, there is no one to hold responsible. Red flag! All the testimonials on the Natural High Blood Pressure Exercises Program page are unverifiable, as there are no photos to confirm the identities of the testimonial names. But if you want to see real testimonials of this program, then simply go to the Amazon listing of the program. There you’ll see that 56% of reviewers gave it a 1-star rating, while only 22% gave it a 4-star. As we saw earlier, High Blood Pressure Exercises Program is a series of three exercises designed to make you relax, relieve stress and help you sleep. Yes, doing these exercises may help you relax and sleep better, which will reduce your blood pressure. But the problem is, you CAN’T stop doing the exercises because if you do, your BP will rise again. Now why do I say this? Because in this life, you cannot escape stressful situations! Hence, Goodman’s claim that his program will ‘permanently’ reduce your blood pressure is false. Restlessness, insomnia and related sleep disorders are mostly caused by hormonal imbalance and activation of the sympathetic nervous system by stress factors. Meanwhile, hormonal imbalance is caused by a plethora of things (eating unbalanced diet, drugs, genetic disorders, etc) and so you have to diagnose the exact cause of the hormonal imbalance before you can do anything to treat it. High Blood Pressure Program does none of these things. Instead, you are only given three non-specific exercises which may or may not work for you. Now do you see the absurdity? Final Conclusion: DON’T BUY Natural Blood Pressure Exercises Program. It is A SCAM! Clickbank is the retailer of this program. If you’ve made the mistake of buying it, I strongly suggest you go directly to Clickbank for your refund. How can you as a medical professional sit there and honestly discount exercise as useful for reducing blood pressure. Lack of exercise are some of the leading causes of obesity which complicates hypertension. Not everything has to be dealt with via medications. Dietary and exercise should always be first steps with somebody with early htn concerns. FYI I am a licensed medical professional myself. Don’t know who you are but my guess is that you’re from big pharma trying to kill anything else than medication use. I had fantastic results with Christian’s program. And so did at least 50% of those who reviewed it on Amazon. And Christian if you really check it out, Christian has hundreds of article published on a various website and ton of people are praising him. Thank you very much for a detailed review of this product. I’m glad I came here before I bought into it. I appreciated if you can advise on products that are a remedy for high blood pressure. Thank you for your time and your help. “Exercises” are very simple things that are easily found elsewhere . . . the first one is just walking, basically. Also, the narrator/instructor sounds like the Swedish chief from the Muppets. The “subliminal” message on the walking part just sounds like some background noise during recording, and is unintelligible. Way less exciting and rewarding than what was promised in the promotion video.